This was a card that we did last night. 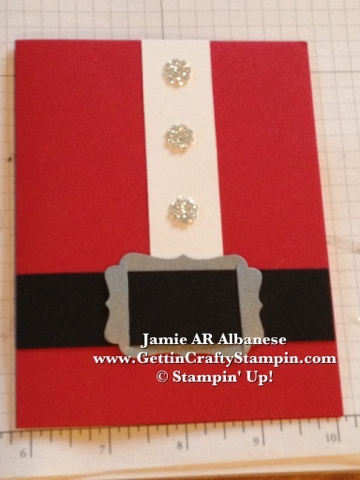 A simple but fun Christmas Card that will delight people of all ages! Taking Real Res card stock as the base adhere a 1"x3-1/2" strip of Whisper White. The Itty Bitty Punch pack created the sparkling buttons out of our Silver Glimmer Paper. The Mini Glue dots button it up (lol). The Decorative Label creates the buckle out of our Silver Paper. 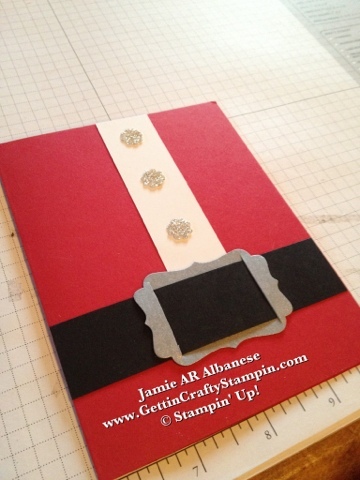 A 1-1/2" strip of black card stock threaded thru allows for the belt look. An easy and fun card! Thanks for looking, leaving a comment and feel free to share it with others!